Warm the olive oil on medium heat in a saucepan. Add the shallots and saute until tender, about 7 minutes. Add the lemon juice, zest, and broth. Bringing them to a simmer. Cover and keep warm over low heat. Pulse the peas, mint, garlic, salt, and pepper in a food processor or high-speed blender to puree. With the processor on add the olive oil in a steady drizzle. Transfer the pea puree to a small bowl. Warm the olive oil in a large skillet over high heat. Cook the salmon about 4 to 5 minutes on the first side for about 2-3 minutes on the other side, more if fish is thicker. Add the tablespoon chopped mint to the Lemon Brodetto and divide between 4 shallow bowls. 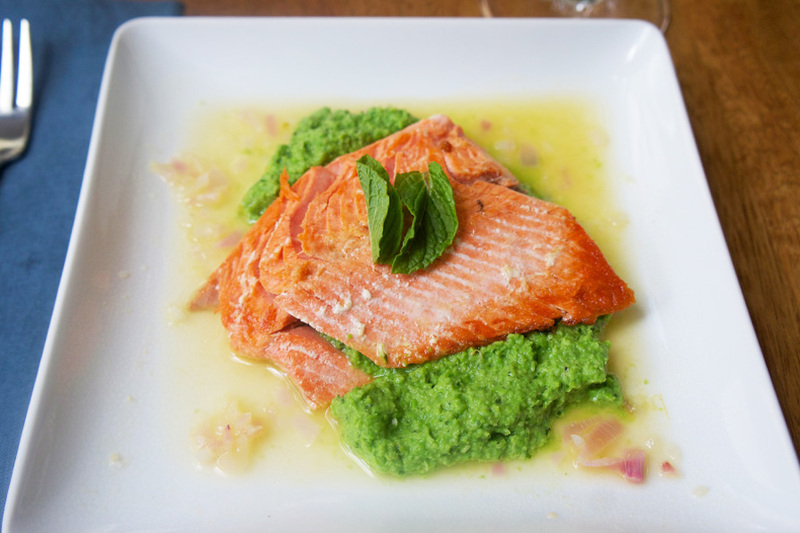 Place a large spoonful of Pea Puree into the center of each dish and top it with a piece of salmon. ** View the original instructions on the Food Network website.